To all of my friends, I hope you are having a wonderful extended weekend. To the rest of the world, I hope you had a chance to play, create and enjoy World Card Making Day this past Saturday!!! Wow! What a blast it is to have a special day just for us card-makers, heh?? I have two fabulous Blog Candy Packages to celebrate WCMD. You don't want to miss our on your great chance to win one of these, so go Check out the details HERE. Now on to the NEW House-Mouse & Friends MC Challenge found HERE! My Teamie Stacy has challenged us to make an ATC turnabout this week. That basically means taking an ATC and creating a card with it. I had a vision of making the BG flowers match the flower on the stamped image. However, it totally took a wrong turn as I went totally nuts with extra fun mousey face details all over the BG that just made this card look totally crazy. Oh well. 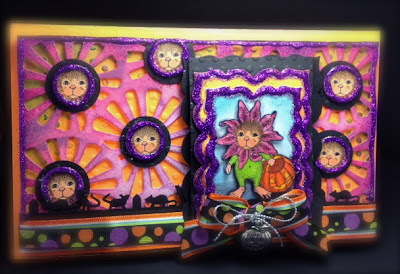 Don't forget to stop by the HM&F MC Blog (HERE), to get inspired by lots of gorgeous ATC samples created the amazing House-Mouse & Friends DT!!! Your card is so fun! Adorable image and those little mousey flowers in the background are so cute. Great border punch detail too. cute and fun card America. So bright, love the mousy faced flowers! I'm loving the cutout flowers and faces in the back of this card. It is so intriguing and unusual. Off course, your coloring is superb as usual. I cannot say enough good things about this card. Love those cute little faces in the flowers! Fun colors and image! Love it! I love your crazy card, America, so funny with all those little faces. LOL How cute is that. Those little faces in the flowes is so cute. WOWEE Americal!!!! 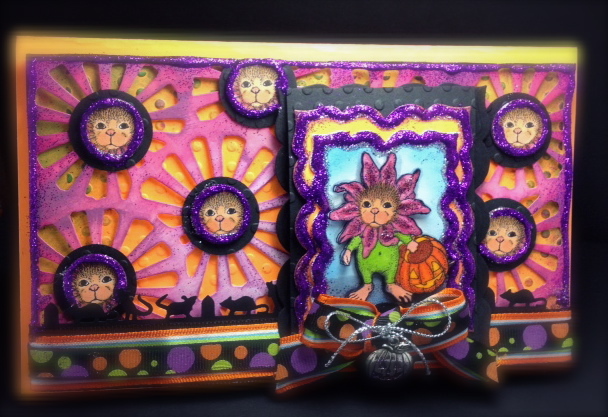 Your design and colours are stunning, I absolutely love all those little face peering out at me from those flowers - I love the little mousies marching along the bottom - such a FUN card!!! I'm still stalking the postie!!! Oh my goodness, those little faces in the center of the flowers is so stinkin cute! What a bright fun card and your ATC little flower child is adorable. Love everything about it. Good to talk to you the other day, thanks for the call. This is gorgeous, I love your cute image and the design is fabulous. Awww how cute is this sweet guy stunning design love those little faces peeping out of the shapes..fab fun Halloween creation.. Wonderful detail work with all those cute mousie faces in the center of the flowers! It's such an adorable card!